The world of banking is changing dramatically as a result of regulation, technology and society. New developments in the past three years include advances in regulatory change, the impact of China and India; from the latest technologies to impact bank services, to the latest experiments with a cashless society. 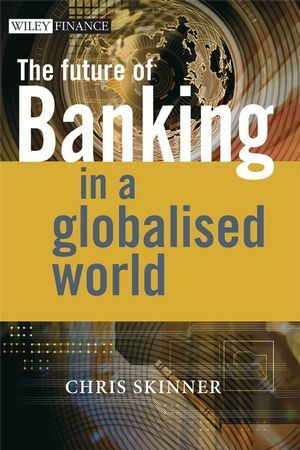 The Future of Banking in a Globalised World provides an entertaining yet informative look at the world of banking and chronicles the radical changes that have occurred in the industry over the past three years. Renowned analyst and international speaker, Chris Skinner assesses the trends that have occurred during the past three years and looks at predictions for the future of banking. CHRIS SKINNER is well-known for his regular columns on Finextra.com and in the Banker magazine, as well as for being a regular keynote at the world’s largest financial services conferences including SWIFT’s SIBOS, BAI in the USA, IIR in Europe and the Financial Times in the UK. When not on the circuit, Chris is Chief Executive of Balatro, a think tank on the future of financial services, and Chairman of the Financial Services Club, a UK-based group which meets regularly to debate the future of the financial markets. He is also Chairman of the Banker's Technology Awards; a Judge with the TradeTech Awards and the Asian Banker's Excellence in Retail Financial Services program; as well as a contributor to the World Economic Forum’s program focused upon the future of banking. He lives in London, England, and can be found regularly at the world's airport lounges gathering views and news on banking worldwide. Challenges for Bankers in the 21st Century. 1. India and China's Impact on Global Banking. 1.1 India versus China, part one: India services the world. 1.2 India's banking: run by civil servants. 1.3 India: the future is still bright. 1.4 India versus China: part two: a Chinese take-away. 1.5 China's banking: a renovation project. 1.6 China's banking: reforming through 2007. 1.7 Lessons to be learnt from China's banks. 1.8 Conclusion: China and India are two tigers you cannot ignore. 2. The Road from Baghdad to Zurich. 4. When Two Tribes Go to War. 4.2 End of round one. 4.4 End of round two. 4.6 A clear knockout, but who cleans up? 5. The European Union Unravels. 6. What Goes Around Comes Around. PART 2. RETAIL BANK MATTERS. 9. The Banks That Like to Say No. 11. Call Centre of the Future. 12. The Big Issue - Fraud and Identity Theft. 12.1 The Internet time bomb. 12.2 The real issue here. 12.3 So what is the solution? 13. Channel technologies Through 2015. 13.2 The reality of the internet revolution. 13.4 Authentication technologies: NFC, RFID and Zigbee. 13.5 Authentication technologies: the question of identity. 13.7 Video over internet protocol: critical for retail banking. 13.8 The decline of the keyboard. 13.10 Key developments in front-office banking. 14. Administration Technologies Through 2015. 14.1 The arrival of the 'always-on society'. 14.2 Principles of the 'always-on society'. 14.2.1 If you stand still, you get run over. 14.2.7 Data versus data management. 14.2.9 Mass marketing versus collaborative commerce. 14.3 Building the 'ever-ready bank'. 14.3.1 The connectivity and authentication hub. 14.3.2 The information routing hub. 14.4.1 Key developments in back-office banking. 15. The Cashless, Cardless Society. 16.1 XML is one key to the TWIST approach. 16.2 'I'm as mad as hell and I'm not going to take it anymore! 16.3 See me, hear me. 17. SWIFT Changes in Wholesale Payments. 18. The Future of Europe's Payments. 18.1 Why force the change? 18.2 The Single Payment Area (SPA). 18.3 How is it going? 18.4 By way of example, I want some euros using my credit card. 18.5 So how have Europe's banks responded? 18.6 STEP2: the Pan-European Automated Clearing House (PE-ACH). 18.7 The melting pot boils. 18.8 The Payments Services Directive. PART 4. INVESTMENT BANK MATTERS. 19. Best Execution With Best Intentions. 20. Make or Break for Europe's Equity Markets. 20.1 The Markets in Financial Instruments Directive (MiFID). 20.2 The end of Europe's exchanges? 20.3 What will MiFID cost? 21. To Trade Or Not to Trade? SIBOS blog 2005: Copenhagen, Denmark. SIBOS blog 2006: Sydney, Australia. Appendix 2. About Chris Skinner.